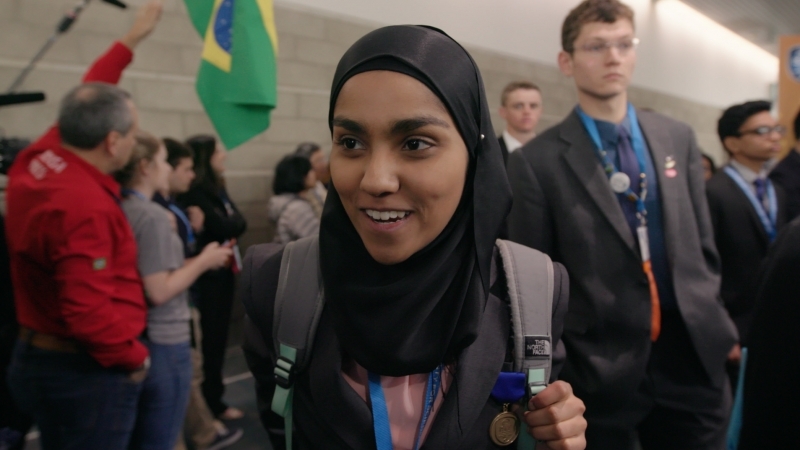 While the students of the inspiring new documentary Science Fair — streaming now on Amazon Prime Video — might take home the actual prizes, it’s one of their fearless leaders who impressed us with this amazing feat: Dr. Serena McCalla, Jericho High School [Jericho, New York] science research coordinator, led her students to win seven Grand Awards — more than any other school in the world at what’s been called the “Olympics of Science Fairs” The International Science and Engineering Fair [ISEF] where 1,700 students from nearly 80 countries compete. In the midst of the documentary’s roll out, we caught up with Dr. McCalla who shared with Aspire her secrets of success, how she faces adversity and why even with the dark clouds over “facts” these days, she’s hopeful about the future. Q. What are your top 3 success tips? Q. Your belief and passion is so strong that in the documentary, you said “I’m gonna be proud when one of my kids wins a Nobel prize because they will!” – how do you sustain that belief? Q. Did you have anyone who tried to hold you back? Q. Women who are direct, especially women of color who are direct can be perceived negatively, what do you have to say about that? Q. You have dedicated your life to the advancement of science. How do we encourage more kids especially girls to fall in love with science? Q. Are you discouraged right now that science and facts are being dismissed by the people running America? Where are we going? Q. Do women bring a unique perspective to the science world, to STEM? Q. What’s a good day? Q. Tell me about the bad days. How do you keep going? Q. Do you have any fears in all this time you’ve struggled with acceptance? How do you deal with them? Q. In the documentary, your students talked about you as the most incredible teacher they have ever had and that you are their mother. What makes them feel that way? What makes an incredible teacher? Q. The public education system globally is under-funded, and we could argue, failing. In your view, what needs to change, what could we do better? “I was literally leaving teaching before I came to Jericho. That’s a story that many people don’t know anything about. I was done. It was so frustrating to work under these people who knew a lot less than me, coupled with the fact that I was working 3 jobs [due to low pay] because I wanted to buy my first home. I was juggling to work as an educator. It’s unfortunate that a lot of people will be lost to education because of that. We’re going to lose the best and brightest minds. They’ll go elsewhere because they’re going to make three or four times the salary if they go into another field. Even some of my students say they’d loved to be a professor but their parents talk them out of it because they know they’ll be poor. We need to ask some of the people who are not educators to stop making the rules of education. For example, we work so hard to to create these standardized exams. Now you have teachers teaching just to the test, so there is no thinking. They are given all this information to memorize. They don’t really understand concepts. When they go to college, they’re even more lost than they would have been if they didn’t have to study for that standardized exam. Q. Anything else you’d like to see in the future? Q. When you are 100 years old, what will you want people to say about your life? *Interview has been edited and condensed for publication. Write to Gayle Jo Carter gayle@aspireforequality.com. This interview was also inspired by the great work of Dr Ellis Crasnow and his team at STEM3 Academy in Los Angeles.